Is Loki one of those rare lime pit bulls? I have to rave about Ella's Leads. I just received one today and it is wonderful! I believe the one I got is the rappel rope (very heavy duty). I can tell how strong it is when we're walking, but at the same time, it's SO soft on my hands! I can't say enough good things about it. The hardware is also great. My lead has the thumb-release bullsnap and it is really heavy duty, which is what I need with my male. Great work overall. A+++! I think our next tag is going to say something similar on the back! We love boomerang tags. I get the plastic ones for now. I'm not quite sure what else I would put on there. Someone made a good suggestion once to put something about having a heart condition and needing heart medication. That way if someone was intent on stealing the dog, they'd be dissuaded a little, possibly, by that engraving on the tag. Now I just have to find some silencers for the tags that match the doggies' new Collarmania collars...I can't wait for those to get here!!! Hmm...based out of SC...I've never heard of them before. I hope this is the right place to put this. I've mentioned it in another post, but wanted to say again how much my girls LOVE Wet Noses Dog Treats. So far we've tried the Pumpkin and the Apple Thyme, and the dogs think they're just the best treats ever. They smell so natural and wonderful (both flavors have a sort of sweet/spicy aroma, much like pumpkin or apple pie ), and they have no corn, soy or wheat in them which is great for my sensitive Riley. They are super crunchy, which I kind of worried about at first for my oldest girl Rosie... she's 14 1/2 and has refused dry kibble and some hard treats for years, and I was sure she would not want to bite into these things, but she does just fine and never passes one up. I like that there are options for ordering in bulk, which I didn't do this last time, but will in the future. You can get a big bucket with all of the different flavors mixed together. Saves money on shipping and with 4 dogs we go through treats pretty quickly. The only somewhat negative thing I noticed was that it took a long time to get my order. It took 6 days just to process, and then another 7 days to actually get to me. But given the quality of the treats, that's not a deal breaker for me. Anyway, I think my search for the perfect treat is successfully over. Try em! the prices are fantastic and if you live locally in nj, you can pick them up and save shipping fees. he is located right off the gsp in North Jersey. It's so funny, because everything that they deem "GUARANTEED INDESTRUCTABLE!" goes in like 2 minutes! My dog is a chewer of epic proportions, and I found a few things to last. One, if your dog really has an attachment to a specific toy they MAY take longer with it to preserve it. I tried out Chubby Buddie's chew toys, they are pretty much a round stuffed animal with a ball inside, so it's not just a ball, it's furry too! It took a few weeks for my dog to get at it, and for $7 it's pretty cheap! Well, to me that is. See, I work on the north shore of Long Island and it does contain some very yuppie people to say the least. I mean, we sell Baker blankets, and some of our coats get up to over $100 dollars. I also find West Paw toys awesome. The stuffed toys are DESTRUCTABLE and EXPENSIVE, but they are 100% made in the U.S! They also make durable toys, and just came out with a really cool toy called a HURLEY, which is a stick-like toy that floats and bounces. b]AKC[/b] wildlife toys are nice too. I don't deal with customer service on the basis as everyone else does, since I manage a store sometimes I think the people are actually NICER to me because they know if they aren't they can lose a lot more business than just one customer, you know? Oh and also one other toy that my dog has NOT destroyed yet. Loopies rope toys. She has had it since she was a puppy and she has yet to destroy it. I highly recommend it! 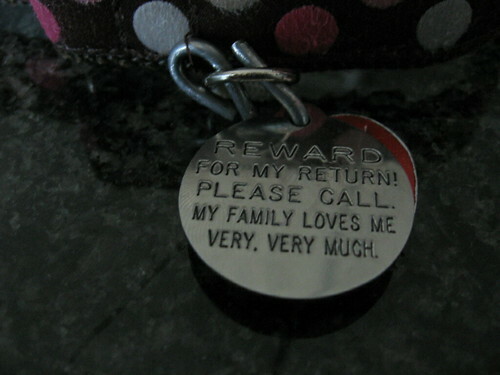 All my dogs have these tags. They are so cool because of the different colors & graphics, & I get them to match each of their collars. And they are really thick and durable. The ONE downside if you like lots of info on your tag is it really only has room for their name and a phone number, possibly one more line. But that doesn't bother me. I love these tags! And they ship FAST! I've only tried the Gallileo/Dino bone because I buy these at the store and usually that's all they had. But I am sure the whole line is great. I love Nylabones; they keep my dogs out of trouble. I tell everyone I know with tough chewers about this line of products. Some people say their dogs can destroy these toys, but my two pit bulls can't. If I let them chew on the Huck & Hurley for a long time, they might get an itty piece out of it but that's it. They're guaranteed anyway, so if they do mess them up, I can send them back for a new one. Lets put it this way: my husband ran over the Huck in the yard with the riding lawn moxer and it barely did any damage! Daisy has had her West Paw toys for two years and now is sharing them with Ninja, and they're all still going strong! The new Tux is a great quick-stuff toy that is good if you need to distract your dog fast because it isn't so deep and you can stuff some treats in their in a jiffy. MY FAVORITE TOYS! The prongs make this a really difficult toy to get food out of (and also to stuff) - I had to cut off two of the prongs with scissors. But it is just as fun as the Kong, but with a cute Squirell shape. My dogs haven't even taken any pieces out of this, and although they haven't destroyed Kong products, they do pull pieces off now and again. It may be stronger than a Kong, but that is up for debate, I'm sure others will prove me wrong!